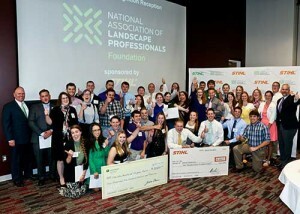 The National Association of Landscape Professionals Foundation awarded scholarships to 53 students. The National Association of Landscape Professionals (NALP) Foundation awarded $69,100 in scholarships to 53 students during the National Collegiate Landscape Competition, held March 16-19 at Mississippi State University. The Foundation also awarded the President’s Scholarship, a $3,000 scholarship, to Ben Harcey from Michigan State University. The President’s Scholarship is selected by the Foundation judging panel, which looks for a student who excels in academics, industry-related activities and community service, according to NALP. The donors, or Foundation Ambassadors, who funded the scholarships were on hand to present the awards to the student recipients. One Foundation Ambassador, Maria Candler, president and CEO of Virginia-based James River Grounds Management, has committed to donating $1,000 for 25 years. “James River is really big on personal growth, development and education, so we want to foster that environment from the beginning,” says Greta Hoyt, business developer at James River. Rodger Phelps, corporate communications manager for Stihl, was the host for the Foundation Scholarship Reception. Stihl is a founding ambassador of the Foundation Scholarship Program and has been for more than 20 years.